So I recently got to flip through Alma Mater: The High School RPG. It seems pretty cool. I had read about it a bit before and seems kinda neat. I did a little more research on it and I gotta say I like the idea of a high school rpg game. Judging by the artwork (by Erol Otus) it is meant to be pretty gonzo, but also seems kinda schizophrenic, to me"High School" just seems too broad a topic for an RPG to tackle. I think you would need to zone in on a specific idea or genre to play a successful high school RPG, perhaps base the game on a TV show or movie set in a high school that the players would be familiar with. Time to laugh, and shiver and cry. It is honestly a pretty silly show, but there is an interesting softer side about coming of age and living up to unrealistic expectations. The main protagonist of the show- Abe Lincoln, lives in the shadow of his genetic self and worries he won't be able to measure up to the original ( he also has an irrational fear of the theater). I think it would really fun letting the players pick their favorite historical figures to play as high school students. As a GM I would get a huge kick out of populating the rest of the school with other historical figures. You could either play a famous figure toward their stereotypes- like making Genghis Khan a football jock or go the other way and reverse roles- have Marylin Monroe be an unpopular geeky type. And always lurking in the background of whatever crazy stuff is happening at the school there should be a shadowy and evil government plot brewing, with mad scientists and super mutants. 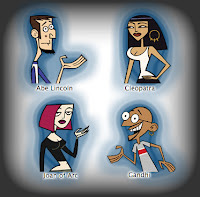 Anyway- Clone High is cool.